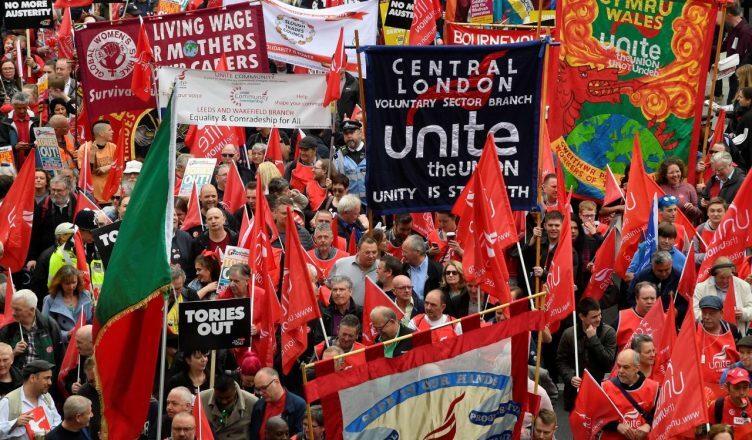 So-called UK: The Anarchist Communist Group comments on the 12th May TUC demonstration in London. Originally published by Anarchist Communist Group (ACG). Workers have gone into action without waiting for the trade union bureaucrats to tell them what to do and they have done this all over the world. The trade union bureaucrats and their allies in the UCU Left sabotaged the recent university lecturers’ strike. Workers have to start organising at a grassroots level. We should not wait for a worthless day of action or the possible election of a Corbyn government at some point in the future. We need to rely on our own strength, solidarity and organisation. Apart from ACG comrades distributing propaganda there was no visible presence of anarchists. This is not surprising taking into consideration the increasingly marginalised and ghettoised “anarchist” “movement” in the UK. Nor was there the presence of a Radical Workers Bloc as on previous TUC demos. Serious class struggle anarchists need to fight this malaise, look for unity with those of a similar mind, and increasingly turn away from the anarchist ghetto and face outwards towards our class. Anarchist Communist Group (ACG), May 14, 2018.